Mayor Kriseman can direct the Police to enforce the current noise ordinance. As of July 2017, Denver noise inspectors were on pace to record more than 600 complaints in 2017. Denver's population is 699,729. Whereas, in St. Petersburg, Florida with a population of 244,769, the city police logged 2,535 noise calls in 2017. 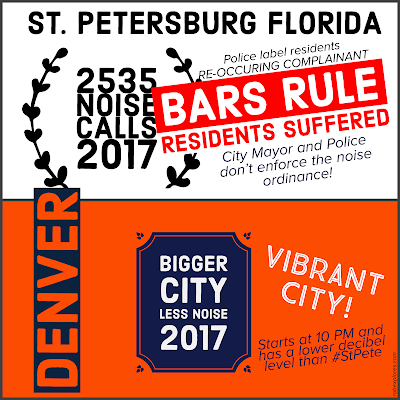 Yet, the City of St. Petersburg, Florida, a smaller city with with 450,000 less people than Denver, had four times as many noise calls. You will hear bar supporters say, if you have a stronger noise ordinance, the bars and nightlife will suffer. Yet, Denver nightlife and entertainment strives with a strict noise ordinance. Noise decibel levels are reduced at 10pm, seven days a week today! Residents have tired of the City creating a hostile environment where bar supporters can bully supporters in the St. Petersburg's Downtown Core and South St. Pete. Residents are tired of being told to move or called names, or being the point discussion on Facebook and NextDoor. The City and Police has has allowed this to happen. It's time for Mayor Kriseman and City Council to lead and not sit on the fence. But the City doesn't have to wait for the revised noise ordinance. Mayor Kriseman can direct the Police to enforce the current ordinance. Mayor Kriseman and Chief Holloway cannot justify a meager 9 noise citations in 2017 when there have been 2,535 calls. Of these, there have been 361 addresses responsible for 1400 calls. Yet, on many occasions, the City and Police will tell the bar to turn it down, over and over again. At homes, they have not stopped the repeat offenders from blasting area homes. For bars and residences with repeat calls for noise, the police have continually asked the bar to turn down the music or threatened a citation. Yet, the police never followed up. Why isn't Police supervision paying attention to the repeat noise calls? 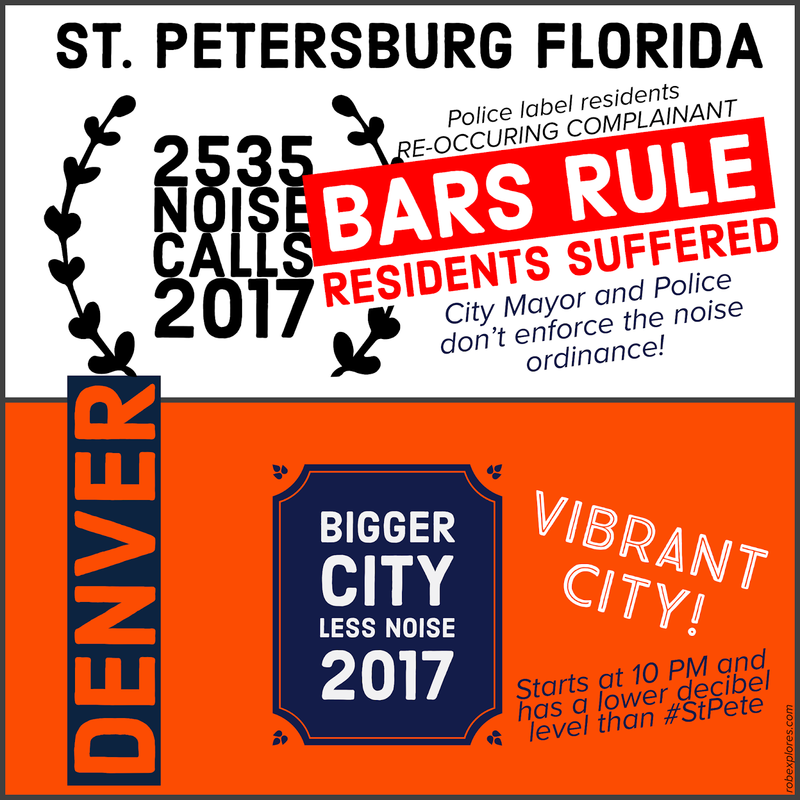 Denver has a stricter noise ordinance than the St. Petersburg's proposed noise ordinance, but only uses A-Weighted for audible noise. The C-Weighted measures bass, and is proposed for St. Pete. This will pick up the thumping inside the home or when the walls are vibrating. Here is Denver's noise ordinance requirements. Now look at St. Petersburg's proposed noise ordinance. City makes allowances for weekends and holidays by adding an extra hour. City increases the decibel level. A 10 dBA increase is the same as doubling the sound's perceived loudness. In the Downtown Corridor Core, the City raises the allowable decibels. This will double the allowable sound not once, but 2.5 times! Wonder what the area condos and apartments think of that! Seems the City is not concerned with resident's quality of life like Denver is! 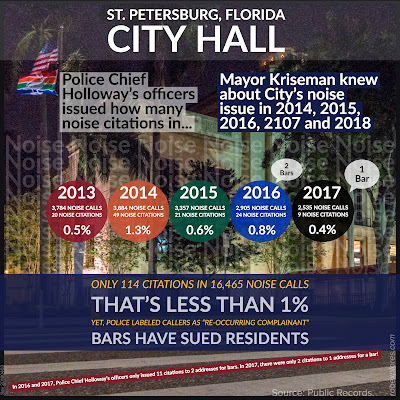 Residents need to ask Mayor Kriseman and their Council Member why the City is still protecting the bars, and throwing residents under the bus! That is what is happening! Until I published the noise data last year, the City Mayor, Council and Police were unaware where the noise was caused by both bars and residents, and where the repeat callers were. The City Mayor, Council and Police thought the noise issue was with the downtown bars. The data debunked what they had been telling us! The interactive map will show you were the 2016 noise calls are located. 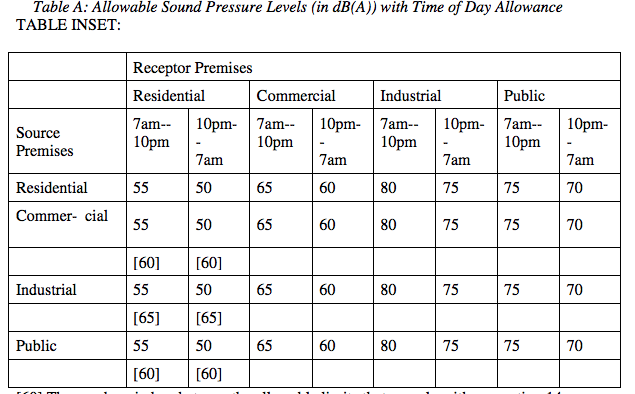 The table is from Denver's Noise Ordinance and shows the allowable decibel levels.